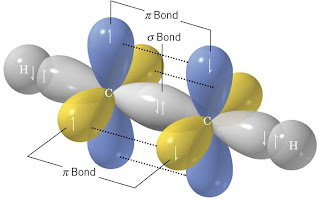 An sp hybridized atom can form two π bonds. 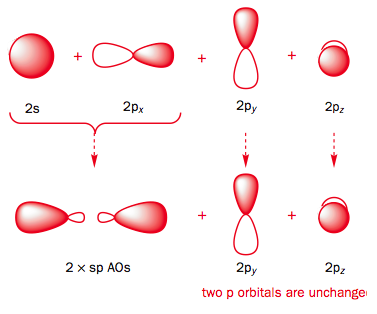 An atom uses one s and one p orbital to form two sp hybrid atomic orbitals. This leaves two unhybridized p orbitals available to form π bonds with other atoms. When two sp hybridized atoms come together to form bonds as in acetylene H-C≡C-H, the sp orbitals overlap end-on. They form the σ framework of the molecule. The p orbitals overlap side-on to form π bonds at 90° angles to each other. The π bonds do not have to be on the same side of the sp hybridized atom. For example, in allene H₂C=C=CH₂, the central atom is sp hybridized. The π bonds are at 90° angles on opposite sides of the central atom.